"Dare yourself…" Distrib Films has debuted an official US trailer for an drama from Paraguay titled The Heiresses (or originally Las Herederas in Spanish), which is Paraguay's official submission to the Best Foreign Language Film category for the Academy Awards this year. This originally premiered at the Berlin Film Festival at the beginning of this year, then went on to play at a great number of festivals all over the world throughout 2018. The film is about a woman who decides to start a local taxi service when she runs out of her inherited money, meeting a young new friend along the way. Described as a "character study with shrewd commentary on class, desire, and the lingering privileges of Paraguay's elite." The film stars Ana Brun, Margarita Irún, Ana Ivanova, Nilda Gonzalez, María Martins, & Alicia Guerra. See below. Chela and Chiquita are both descended from wealthy families in Asunción and have been together for over 30 years. But recently, their financial situation has worsened and they begin selling off their inherited possessions. But when their debts lead to Chiquita being imprisoned on fraud charges, Chela is forced to face a new reality. Driving for the first time in years, she begins to provide a local taxi service to a group of elderly wealthy ladies. As Chela settles into her new life, she meets the much younger Angy, forging a fresh and invigorating new connection. Chela finally begins to break out of her shell and engage with the world, embarking on her own personal, intimate revolution. The Heiresses is both written and directed by Paraguayan filmmaker Marcelo Martinessi, making his feature directorial debut after a few short films previously. This premiered at the Berlin Film Festival earlier this year, and also played at many other fests. 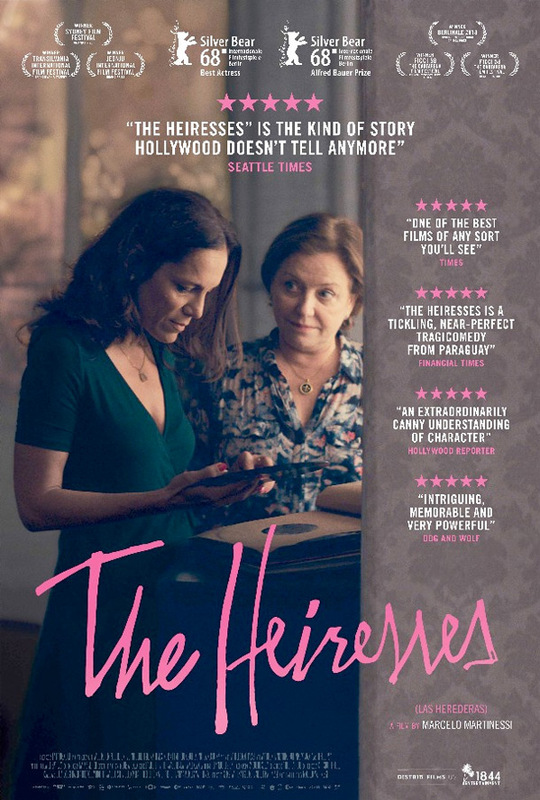 Distrib Films will release Martinessi's The Heiresses in select US theaters starting January 16th next year.